Pressure is a measurement of force per unit area. Unfortunately, there are many different units associated with pressure. The SI unit for pressure is the pascal (Pa). One pascal is equal to one newton per square meter (N/m2). One pascal is a very small amount of pressure, so the kilopascal (kPa) is often used instead. Another common pressure unit is the atmosphere (atm). 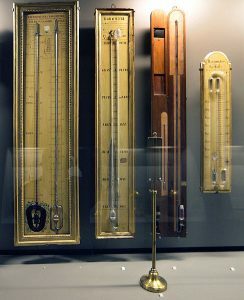 The atmosphere unit was originally the defined standard for pressure measurements and corresponded to the average air pressure at sea level. This unit lasted until well into the 20th Century and is still in use for many applications in chemistry, thermodynamics, and weather. This example problem shows how to convert atmospheres to kilopascals (Atm to kPa). A 2 liter PET soda bottle will explode at 10.2 atmospheres. What is this pressure in kilopascals? The relationship between atmospheres and Pascals is: 1 atm = 101325 Pa. There are 1000 Pa in 1 kPa. Multiply 10.2 atm by the conversion factors above to find the number of kilopascals. The 2 liter bottle will explode at 1033.5 kPa. For further explanation of using conversion factors in this way, check out How to Convert Units and the Ladder Method. Fun fact: While researching the pressure required to burst a 2 liter bottle, I found the pressure necessary for an empty 2 L bottle is right around the 150 PSI mark.